We all rely on our eyesight in almost everything we do. This is why good vision is important, and you can rely on us here at Coverdales Opticians to provide you with a caring, personal and professional eyecare service. 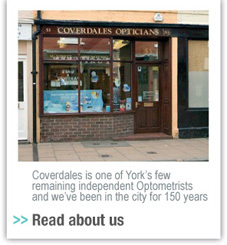 Coverdales is a long established York opticians with traditional values and progressive thinking, and where patients needs are the core of our business. Our dedicated team ensures that you receive the highest standards of care, quality products and outstanding value for money. We warmly welcome families from toddlers to the elderly. So if you haven't had your eyes tested for a while, or have concerns about your eyesight in any way, why not pop in for a chat to see how we can help?